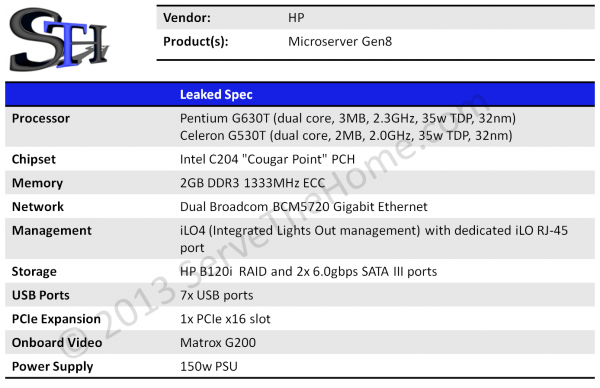 Respected home networking blog ServeTheHome has leaked the upcoming specs of the new HP Microservers, of which the G7 Models (N36L, N40L, N54L) have all been wildly successful amongst the tech crowd for their low price, high flexibility and miserly power usage. Many people used them as a home-built NAS when loaded with FreeNAS, others like myself use them as a home ESXi lab for learning. They also made a good XMBC box for media playing, streaming and recording. When they could be picked up at some points well under AUD$200, it’s no wonder the tech community embraced them. There was even a HP Microservers Facebook page set up for them! Online forums like OCAU, HardOCP and others have threads on the G7’s stretching into multiple thousands of posts. The G8 Microservers differ from the G7 models in many respects, firstly the aging AMD Turion dual-core CPUs have been replaced with newer Intel chips along with the Intel C204 ‘Cougar Point’ chipset. You have a choice of the Celeron G530T or the Pentium G630T. The Celeron clocks two cores at 2.0Ghz with 2MB cache to get an average CPU Passmark of 1604, while the G630T also sports two cores at 2.3Ghz, but increases the cache to 3MB. This boost takes the G630T to an average CPU Passmark of 2154 which is well over double the N40L’s 979 Passmark. One of the biggest issues with the G7 Microserver was memory support. While it sported ECC non-Registered RAM and could also take standard DDR3 memory, officially it only supported 8GB. While some in the Microserver Community were able to get them running with 16GB of RAM, DIMM compatibility was crucial to the success of booting the hardware with 16GB. The G8’s will support ECC memory again, but at this stage we do not have any information on the maximum memory support. We expect 16GB at a minimum, but 32GB may be possible. Any of the ECC memory that G7 owners used in their older hardware should be transferable to the new hardware – great news! Another major boost is the inclusion of HP’s iLO4 hardware management which is usually included on their higher-end Proliant Servers. The G7 lacked this feature, although had a proprietary slot for a RAC (Remote Access Card) which gave similar functionality. The NIC’s have also been upgraded to Dual Broadcom-based ports and the iLO port is a separate, dedicated port unlike the ML310e G8 which requires a optional mezzanine card for a separate port. 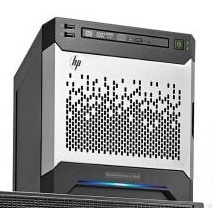 HP’s B120i RAID solution also features in the G8 Microserver, a far cry from the AMD RAIDXpert chip on the G7. This is also fitted to the higher end Proliant offerings like the ML310e G8 and gives ESXi support out of the box, something the AMD solution did not. There is no real information what RAID levels this will support for now, but we know it can do RAID levels 0, 1 and 10 out of the box, and if fitted with 512MB of cache it can do RAID5 also however that may require a HP SmartArray Advanced software key. Until we get more information, we cannot really tell what the hardware will support. There’s also 2x SATA3 (6Gbps) ports on the Microserver, perfect for a couple of SSD’s to be added. The pictures we have found of it also show a slim optical drive, although it is likely that the internals will be much tighter so finding a place to put them or other mechanical drives may be a problem. I have a feeling you will not be able to stuff an extra 3x 3.5″ drives into it like some people were able to do with the G7 chassis. Hopefully there will be a couple of mounts for 2.5″ drives in there somewhere. USB ports have been a major talking point in the community, and USB3 ports have been high on the wishlist of many. The Intel C204 chipset supports 6x USB2 ports, although the leaked specs say 7. There is a possibility of a USB3 controller chip but I would not hold my breath for it. HP has also given us the new G8 styling, bringing the look of the unit into what many would call style. The G7’s flat black look was sufficient and was able to be hidden away reasonably well, but the G8’s look so good that you will want to show them off! I am really looking forward to these being released. My ESXi boxes are really struggling with disk writes as the CPU is reasonably slow. A 4-spindle RAID5 array off a P410 card simply does not see the performance it would in a reasonable desktop CPU. RAM being capped at 8GB is another issue, it really limits the amount of VM’s you can have, especially if you cannot get 16GB to work on your G7 Microserver. They should also be compatible out of the box with HP’s ESXi Custom Image which already has all the drivers for the G8 Broadcom NICs and B120i controllers. Of course price will be the issue and I think we will see the retail price on these to be $499 for the G530T and $599 for the G630T to begin with. The N54L’s will be run out with rebates in the near future, You should be able to pick them up for about $180 very soon, even though the current price hovers at about $269. Keep an eye on StaticIce for the special deals.